Many of the greatest jewelry designers have chosen to use unique materials in memorable creations. During the art deco era, Cartier incorporated pieces of ancient Egyptian faience in jewels set with precious and semiprecious stones. Fulco di Verdura put the seashells he found on the seashore into gem-set gold brooches during the 1940s. Moore recently at Couture Week in Paris, feathers were spotted in the sensational Piaget Sunny Side of Life collection. While others delightfully dabble outside of prescribed precious materials, everything Hemmerle produces has a surprise ingredient. Aluminum, copper, stainless steel, brass and silver are some of the unorthodox metals the Munich based house mixes with extraordinary gemstones. These mismatched earrings exemplify the unique approach. 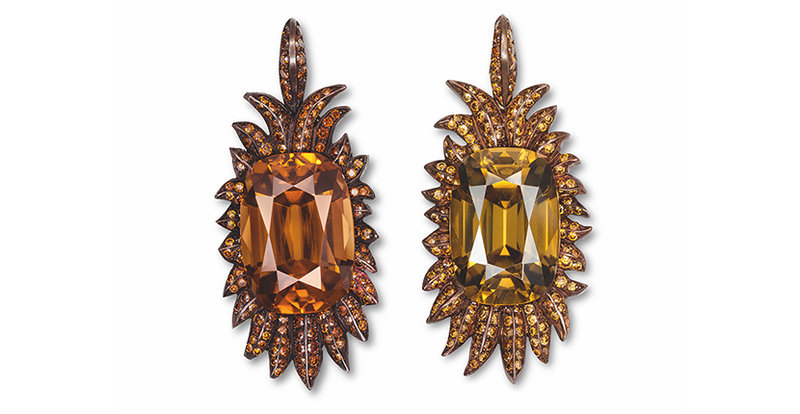 The flame-shaped silhouette is lit up with diamonds and rare natural reddish brown and yellow zircons weighing 14.26-carats and 16.65-carats. The unexpected part is in the mounting. It’s a combination of gold and silver blended in an specially colored alloy, made to mesh harmoniously with the zircons. Like so many pieces in Hemmerle’s collection, these earrings are one-of-a-kind creations.